Yesterday Was Sunny And Sooo Nice!! 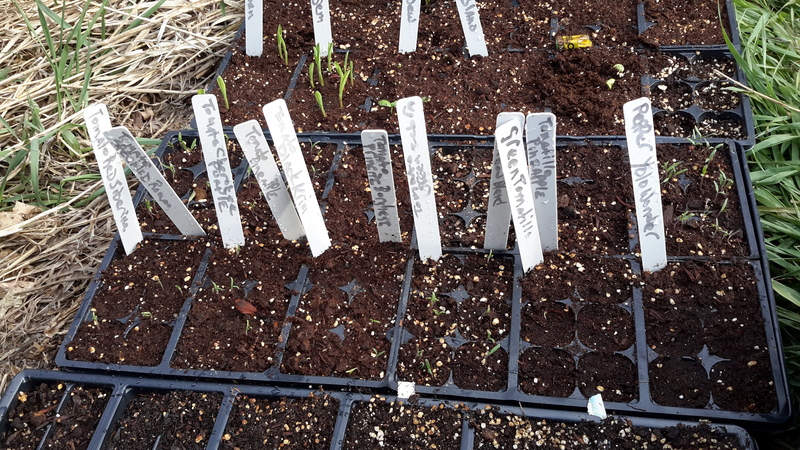 My seeds for the garden are barely starting to come up. 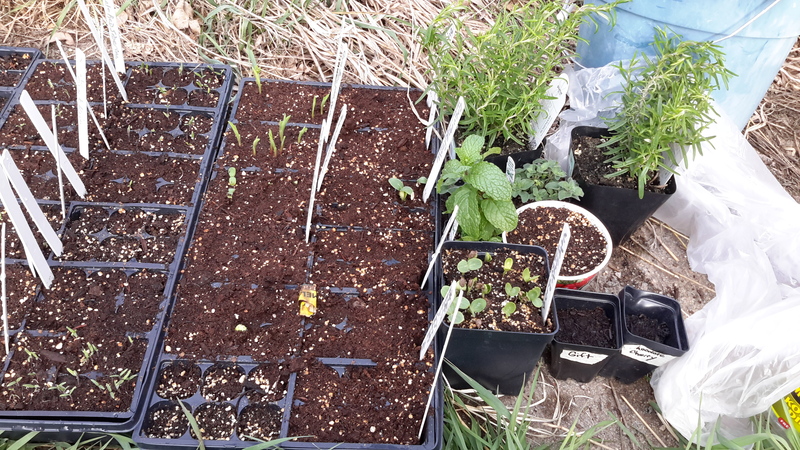 I actually tagged things – wow.It is hard to see the tomatoes coming up in the photo, but you can see the corn coming up on the top left. Yummy! I am keeping them covered with plastic right now as the Colorado sun is really hot and it’s been breezy, so things dry out too much. The pots are Bush Rosemary in the back, there are two Spicy Oregano plants in there, a Spearmint, the square pot is Sun and Moon Watermelon, and the two small squares are Chocolate Cherry Tomato and a ‘Gift’ tomato, both from my friend Ruth. The round pot? 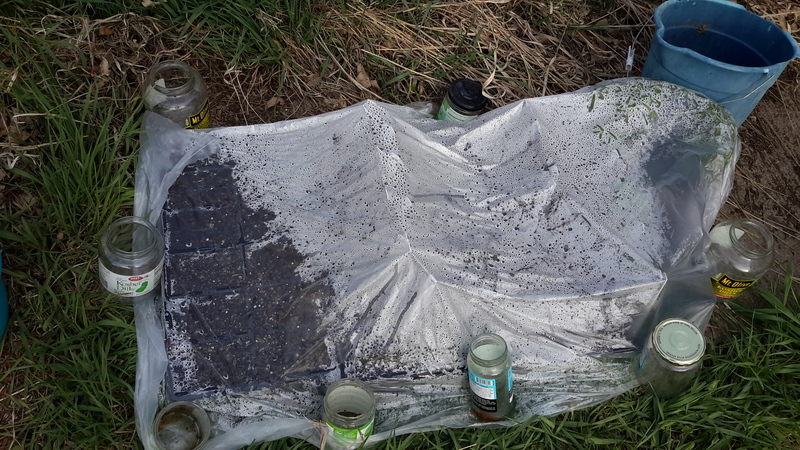 Well, a squirrel got into the garage where I had the flats stored for nighttime protection – I scraped up the mess and reseeded the flats where it dug, then scraped all the dirt it kicked out onto the top of the round pot and watered it. We will see if anything was salvaged or if the little bugger ate all the seeds. Little rat – I feed them plenty of sunflower seeds and other goodies! Of course, I am going to have to build fencing around the boxes – or else the bunnies will be eating all the goodies from the garden… I think I will try using PVC pipe to make hoops over the bed and cover with sheet plastic? Hum… nah. Probably won’t work. It gets way too windy here. 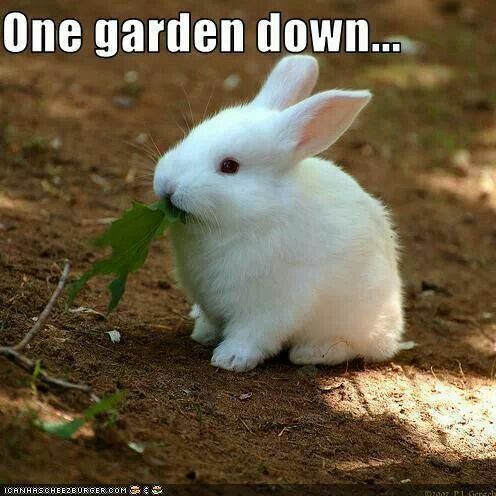 Anyone got any ideas for keeping the bunnies from munching down on my garden? 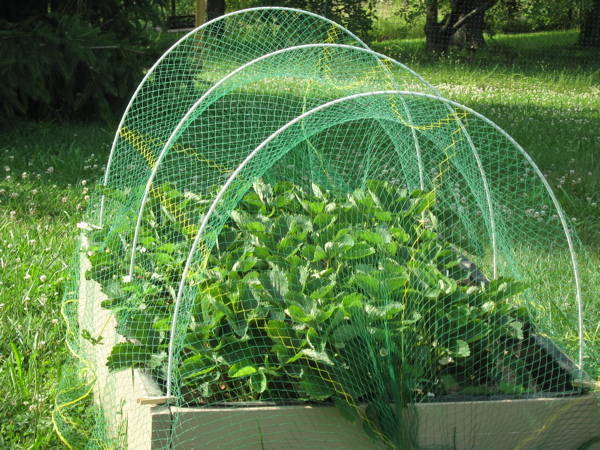 Oooh… just found this on http://abundantminigardens.com The netting wouldn’t catch the wind like plastic covering would! 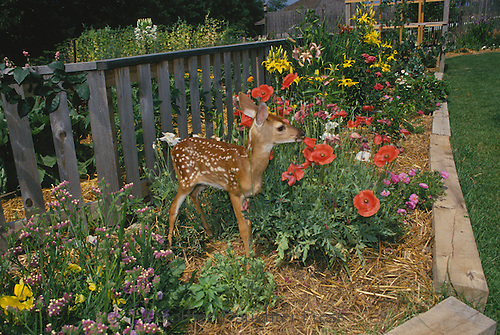 And then there are the deer… (even though they are darn CUTE! The blue and white to the right side back is a silk scarf I threw in with everything else. 😉 Just a dye, not a paint job, but it turned out nicely. 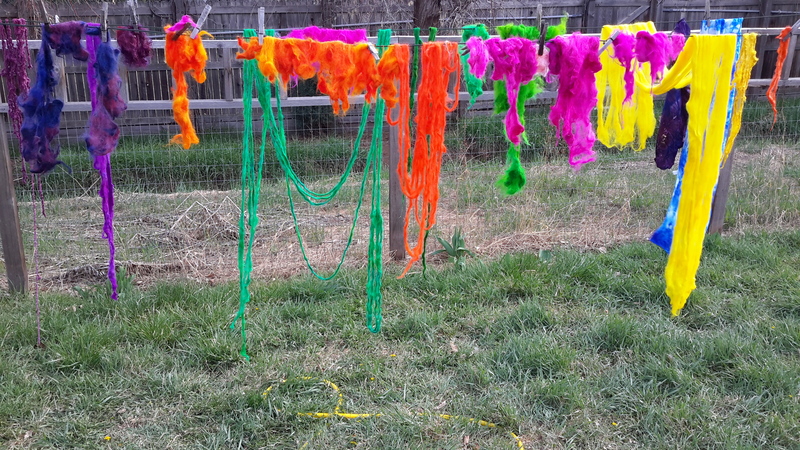 The colours just sing on the silk, don’t they? As for the time… I find that I burn out if I work too hard on one thing for too long, reading, reviewing, editing. I have to work in my studio to keep myself sane… now, hopefully, I will have my garden as well – if I can get my boxes all braced up and filled! It IS! I just moved a space heater into the mud room where the plants are – looks like it is going back to c.o.l.d. today…. brr! So, lights on and heater on, the plants hopefully won’t suffer! 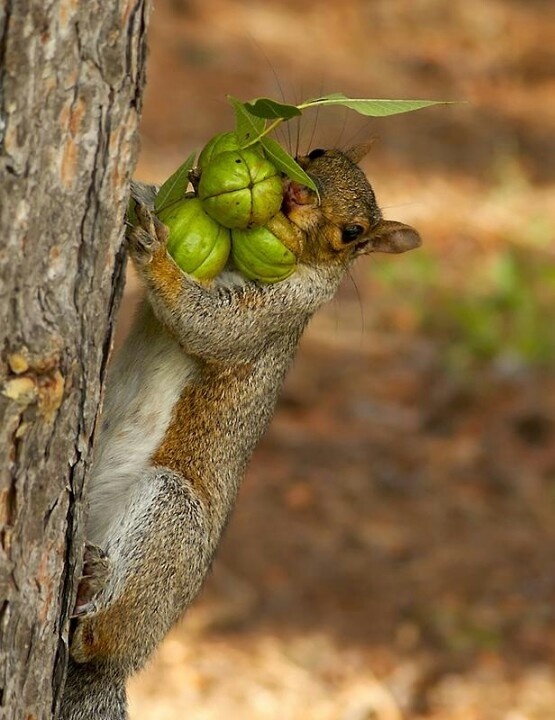 Great critter pix! Hard to keep them from eating everything, but they are just so darn cute.